February has been a lovely month so far in our little corner. We've had some very cold temperatures that puts quite a chill in the air. Then we have had a stretch of quite warm weather where we can go outdoors with just a light jacket on. I remember years ago my Mama saying this was "pneumonia weather." She always said we needed to have the cold to kill all the germs. I'm not sure she was right, but it does make sense. It's always nice to be able to get out into the garden, although very wet, and continue to rake the mountains of leaves we have in our mulch beds. The roses have now all been pruned and should be happy to bring us blooms in May. Being February I'm sure we will have many more winter days, so I try not to jump the gun too early as far as gardening goes. I've had plenty of time to clean all the cabinets in the living room. Sudsy water works wonders on all the Depression Glass. This should happen at least once a year and I must confess it did not last year. The sunsets have been quite pretty this time of year. The sky seems to catch on fire with the final bow of the sun. During the cold days I am blessed to have some lovely wool sweaters that our daughter made me. It seems the older I get the more chilly the afternoons seem. During a recent visit Noel was wearing a lovely shawl. She asked if I would like one and it didn't take me long to say yes! If you haven't noticed I love red! 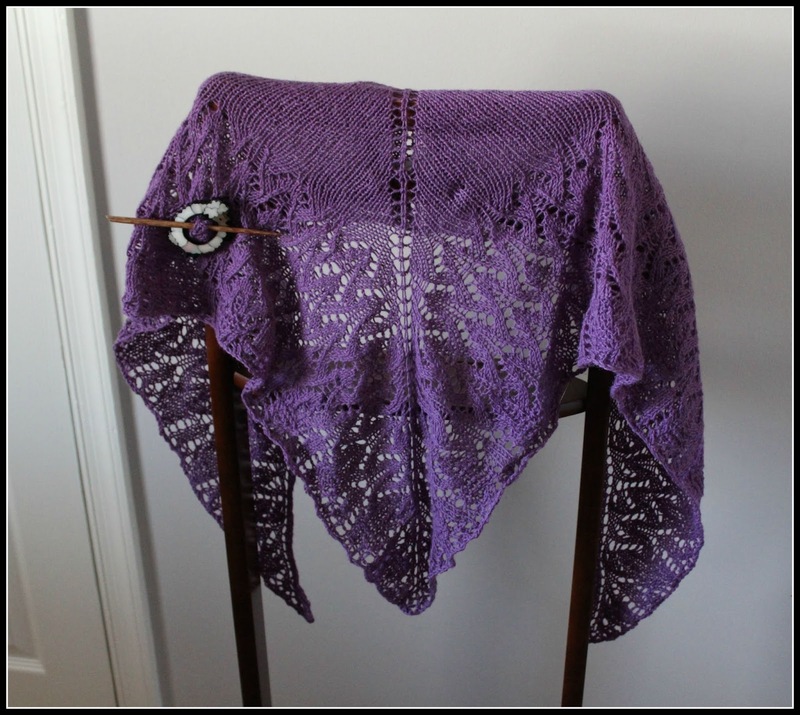 Soon this warm shawl came in the mail. It's nice to put on my shoulders in the afternoon and evenings. 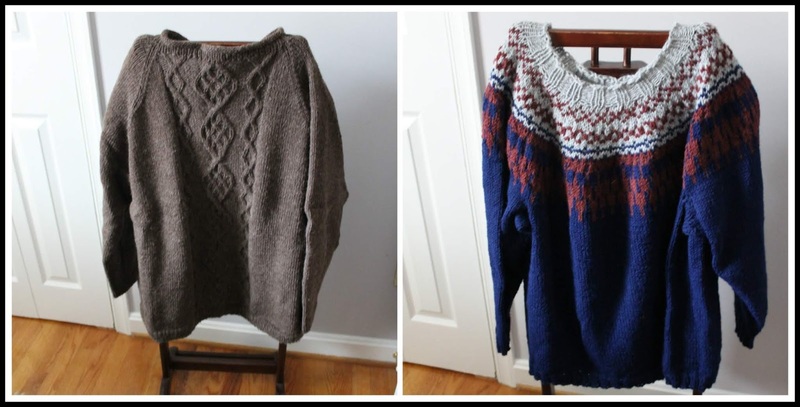 Here are the sweaters that Noel has made me over the years. Whenever we visit cold climates I always take one along. Wool is very warm and toasty. Grayden's sweaters were made by Noel as well. We are so fortunate to have a creative daughter and one that gifts her parents her creations. I failed to put this lovely lace shawl Noel made for me. It's lightweight and was wonderful to take on our trip to Hawaii. Notice the darling little lamb shawl pin that she gifted me as well. 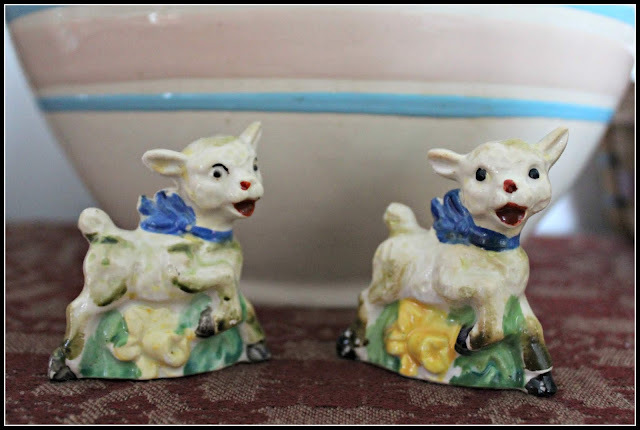 I spied these cute little lambie salt and pepper shakers while in an antique shop. When they looked at me, I had to bring them home to our kitchen. The tea kettle is ready and soon the tea will be also. I hope you will join me! Oh your daughter is a very talented knitter...those sweaters and that shawl are gorgeous. I have heard that this is pneumonia weather as well. Even my corner has enjoyed a string of warmer than usual days. I would love to join you for tea...what kind are you serving? Oops, meant to add that you have a very nice collection of pink depression glass. Vee, there is a selection of teas I received at Christmas that you can choose from. I always have Earl Grey on hand as well as that is my favorite. I especially love the red shawl your daughter knitted for you. We are enjoying the same sort of sunsets from our front windows. We can see the mountains in the distance when the leaves are off the trees and it's quite spectacular! Cathy, I love the shawl hanging on my chair and draping it over my shoulders when needed. The sweaters are very beautiful. Oh Martha Ellen, what a charming post. I LOVE your tea pot, and have always wanted one just like it with the black and white checkered. Your brick reminds me of my dear mom's house, which she plastered the bricks herself. Such a talented woman. Speaking of talented....your daughter made these beautiful sweaters for you. They look so nice and warm with pretty designs. I didn't know you love to wear RED, me too! What a thoughtful gift this red shawl is. Your living room looks very nice, and those lamb figurines are sweet. Sheri, I remember you mentioning your mom's bricks in her kitchen. We had them put in when we built this house 45 years ago. I considered having them painted when we painted the kitchen a couple of years ago, but decided against it. Nellie, 77 degrees is quite warm for February! On our walk this morning I only had on a light weight jacket. Usually I'm bundled up with a hat and gloves. I hear next week could bring winter back to us! What a lovely post, I love your depression glass(I collect green).I'm a knitter myself and I can see what a beautiful job your daughter has done.Just getting started on my spring cleaning but a cup of Earl Grey is calling me! !Always look forward to your blog! Glass is always so spectacularly splendid and sparkling after a sudsy wash and rinse! I love burning candles in some of mine of an evening. What a beautiful shawl your talented daughter, Noel, knit for you! My Great Grandfather and his daughter always said if we didn't get a proper "killing frost" each winter we would pay for it the following spring and summer. They were correct, for it helps redress the balance of pests and disease in the garden. You have such a beautiful home! I would love to 'hang out' with you in your kitchen! And I love red too and wear it a lot. The hand knitted sweaters are all gorgeous! I think another cold snap is coming so keep them handy! Enjoy your day! That Depression Glass really appeals to me. I had a pink doll tea-set when I was a child. Loved it! However, that has never been one of my collection manias so I just enjoy seeing it in someone else's china cabinet like yours. Liz, I am feeling much better, thank you. It's nice to feel like doing the things that I enjoy! Those knitted creations your daughter gave you are works of art, really beautiful! She is a very talented lady for sure. 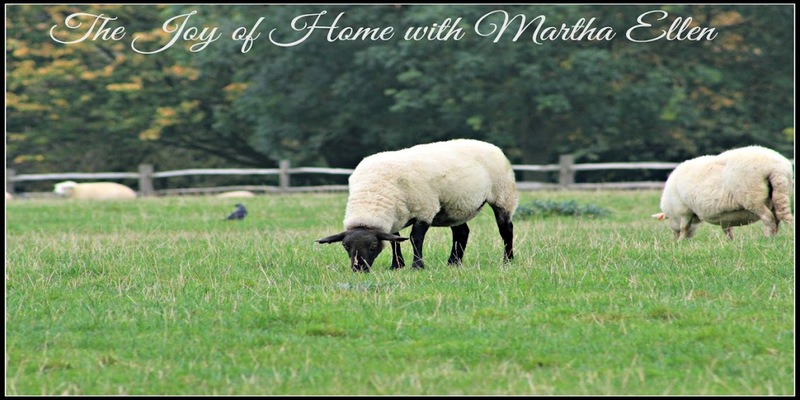 I love your home and your decorating style Martha Ellen. Your collectibles are very pretty, as are those darling lambs, and your daughter's pin. A beautiful sky photo too. After all the chilly weather it was a real pleasure to go out in just a sweater the other day, and even that was a bit too hot for me. Have a great weekend and not sure what the forecast is but hopefully it will be a good one for us. Now this is a drool-worthy post! I LOVED getting a peek into your cozy and beautiful living room. I think I could be quite happy there! And those sweaters . . . who would mind the cold with such a lovely collection of sweaters to wear?! Your daughter is very talented! Doing my coffee this morn. Slow start to the day cause I normally have my coffee at 6am and its now 10. But if not for coffee a good warm cut of hot tea is great. Beautiful sweaters and shawls. I love....LOVE...the purple one for sure. They do such a great job on those. I am sure you are very proud. Mom had a mess of depression pink glass. 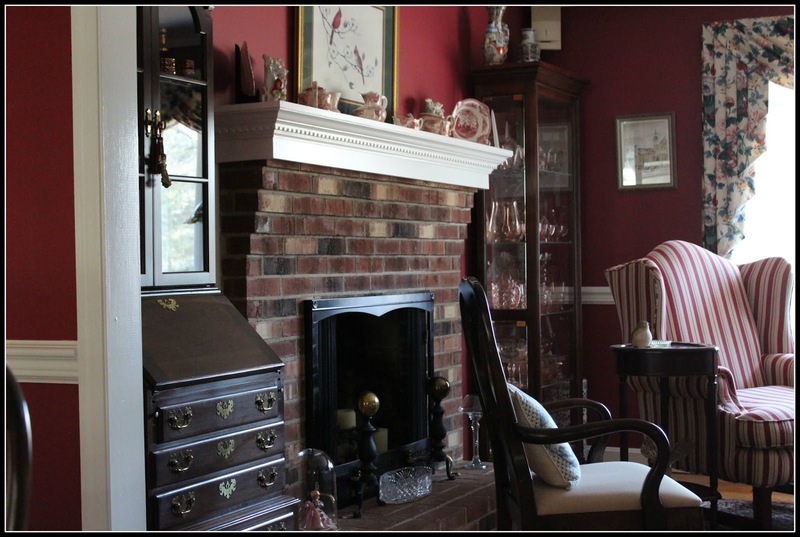 We packed all that up over a yr ago in bins from the china cabinet so she could have the living room/dining area painted. We never got around to putting that stuff back up for her cause she could not decide what she wanted to display. Kitchen looks like a great place to sit and enjoy that tea! Enjoy. Your room looks so nice and cozy and I just love depression glass! Those sweaters and shawls are gorgeous! She should open a little shop to sell them :-) The salt and pepper shakers are so very dear! 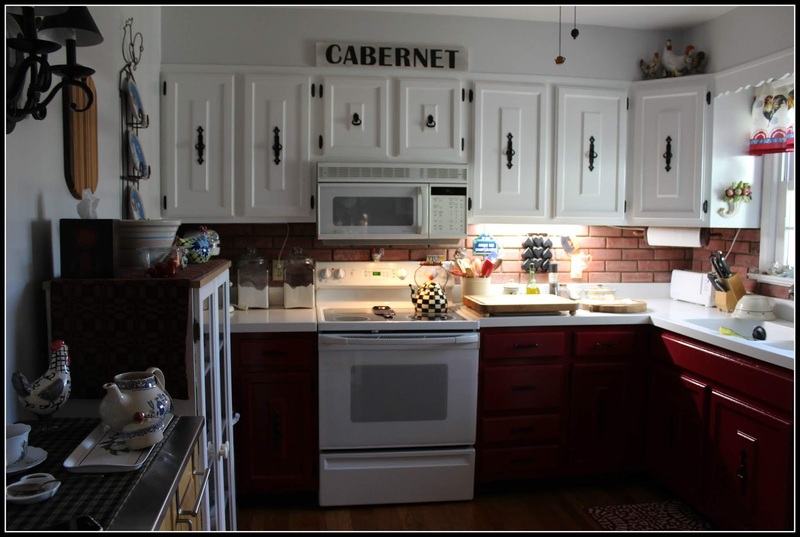 What a wonderful addition to your lovely kitchen! Thank you for sharing, I hope you are keeping warm! I love the red shawl your daughter knitted for you. I hope that it is keeping you cozy and warm. 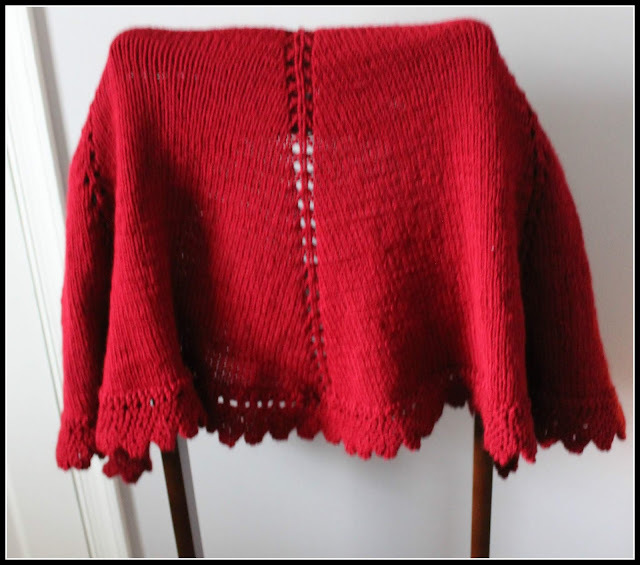 Dear Martha Ellen ..I would dearly love to cosy up in one of those beautiful shawls to enjoy a cup of tea with you. OMG ... what a beautiful knitter your daughter Noel is ... How very sweet that she culls her creativity caring for her mom ... It's a whole beautiful wardrobe of warmth . I believe that your mother was right about the pneumonia season ... because I get it every February. Oh my, how blessed you are to have a daughter who knits so beautifully! They're all beautiful! I can't wear wool, and what a shame, for I love it! I would like to have a sweater made from Yorkshire sheep, but that will never happen. I love the little sheep S&P. I wouldn't have been able to resist them either! Darling. Mom always says the same thing about this being pneumonia weather. I felt like jumping the gun the other day when I purchased strawberry plant and something that looks like a poppy, not sure exactly what the root is now since it's not in front of me. Red is a color favorite of mine to along with purple. Beautiful sweaters your daughter made for you and the wool would be so good to wear on these chilly and some downright cold nights. I like the red walls in your room and that secretary is something I am looking for, for my living room..
Stay warm as Wednesday we are supposed to get a mix in Ashland of rain and snow, it's what I last heard anyway. One day warm, the next cold or pneumonia weather as our Mothers called it. Betsy, the forecast does seem like we are in for more snow tomorrow evening and into Wednesday--pneumonia weather for sure! I'll be wearing one of my warm sweaters for sure. 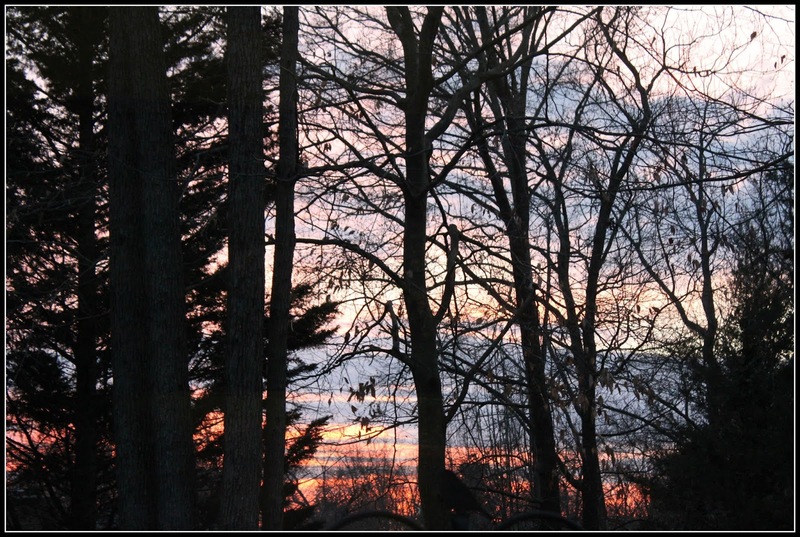 Loved the sunset photograph, such a beautiful sky. I do like the sweaters and shawl that your daughter made, so warm and cosy.